Continental Center I (originally named 1600 Smith Street, also known as Cullen Center Plaza) is a 51-story, 732 feet (223 m) office tower in Downtown Houston, Texas, United States. The building is the headquarters of Continental Airlines. At one point it also served as the headquarters of ExpressJet Airlines. It is a part of the Cullen Center complex. The 51 story building has about 1,098,399 square feet (102,044.6 m) of rentable Class "A" office space. Devon Energy Tower, also known as Two Allen Center, is a 521 ft (159 m) tall skyscraper in Houston, Texas. It was completed in 1978 and has 36 floors. It is the 24th tallest building in the city. The tower houses offices for Oklahoma City-based Devon Energy Corporation. The building has travertine flooring and is Energy Star labelled. It is owned by Brookfield Properties. Hess Tower is a 29-story skyscraper located adjacent to Discovery Green park in downtown Houston, Texas. It was formerly called Discovery Tower until Hess Corporation leased the entire tower in January 2009. It is the 30th tallest building in Houston and was completed in May 2010, 26 months after construction began in March 2008. Occupation of the building should begin in June 2010. The El Paso Energy Building is a 502ft (153m) tall skyscraper in Houston, Texas. It was completed in 1963 and has 33 floors. It was originally known as the Tenneco Building. It is the 28th tallest building in the city. 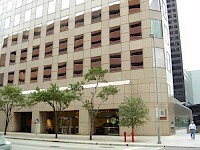 Because of downtown Houston diagonal street grid, all four sides of the building are exposed to the sun. The windows are recessed from the frame to control heat and glare from the sun. The footprint of the building is an exact square. Enterprise Plaza (also known as 1100 Louisiana) is a 55-story skyscraper located on Louisiana Street in Downtown Houston, Texas, United States. The headquarters of Enterprise GP Holdings is located in the Enterprise Plaza. Enbridge's Houston offices are in Enterprise. Enterprise Plaza was constructed in 1980 by Hines. The Fulbright Tower is a 725ft (221m) tall skyscraper in Houston, Teaxs. 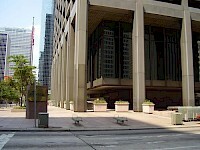 The JPMorgan Chase Building, formerly the Gulf Building, is in Downtown Houston, Texas, United States. 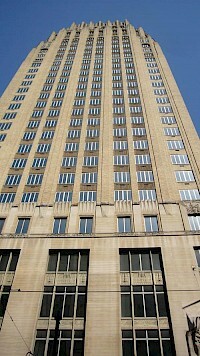 It is one of the preeminent Art Deco skyscrapers in the southern United States. Completed in 1929 it remained the tallest building in Houston until 1963, when the Exxon Building surpassed it in height. The building has the Houston headquarters of JPMorgan Chase Bank, and it was formerly the headquarters of Texas Commerce Bank. Jesse H.
Heritage Plaza is a skyscraper located in the Skyline District of downtown Houston, Texas. Standing at 762 feet (232 meters), the tower is the 5th tallest building in Houston, the 8th tallest in Texas, and the 60th tallest in the United States. The building, designed by Houston-based M. Nasr & Partners P.C., was completed in 1987, with 53 floors. Heritage Plaza completed construction in early 1987. 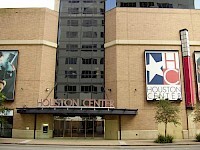 Houston Center is a retail and office complex in Downtown Houston, Texas, United States. It is owned and operated by subsidiaries of Crescent Real Estate Equities Co. (NYSE: CEI). The three towers in Houston Center have almost 3.4 million square feet of Class A office space. The buildings in Houston Center include: Texas Eastern Corporation bought 32 blocks of land in Downtown Houston for $50 million; many of the blocks included slums. The Houston Tower was a visionary skyscraper to be built in Houston. It was one of the tallest buildings ever fully envisioned, and would have taken up 16 city blocks if ever constructed. Its design was reminiscent of the Willis Tower, only the "tubes" in the Houston Tower would number 16 and be triangular.